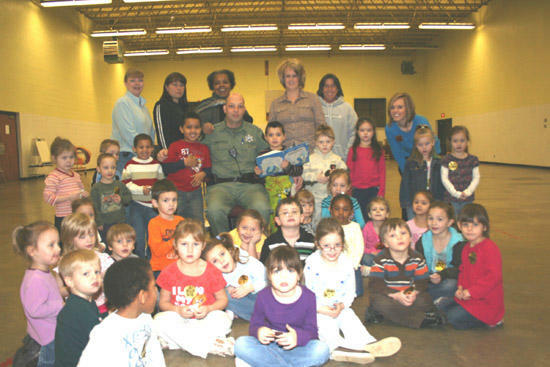 Cannon County Sheriff's Deputy Anthony Young read to students at Woodbury Head Start Thursday. The Cannon County Sheriff’s Department was honored by the Woodbury Head Start on Thursday, February 25 to participate in the “Reading Is Fundamental” (RIF) program. Deputy Anthony Young visited with the kids and read aloud while discussing books and also explained some of his duties as a law enforcement officer. “The primary focus of the challenge is family and community involvement in motivating children to read,” said Eva Woodlee, Area Manager for Mid-Cumberland Head Start. The Reading Challenge began on February 22 and continues through Friday, March 6. “The Challenge provides a fun way for individuals and local businesses to inspire children in Cannon County to read. We appreciate Deputy Young and the Sheriff’s Department participating in our reading program,” said Lori Reed, Read With Me Community Challenge Leader. Sheriff Billy Nichols presented members of the class with Junior Officer Badges, coloring books, lollipops, glow light bracelets and literature for the parents of the children on drug education which were passed out to the children by Deputy Young and Sheriff’s Department Public Information Officer Andy Bryson. Those students taking part in the reading program included: Ally Gentry, Alisha Owen, Blaine Simons, Dustin Johnson, Dylan Hoover, Gavin Franklin, Hailee Gunter, Hanna Foster, Hannah Jo Faulk, Jayda Patrick, Josh Emadi, Kathnn Garcia, Katie Davis, Kimberly Johnson, Kloi Bruzzese, Montana Davis, Mykala Barrett, Tyler Campbell, Whitney Johnson, James Albert Alexander, Delayiah Bunford, Brianna Dykes, Cade Emberton, Chance England, Preston Fuqua, Devin Grant, Krista Warren, Riley McGuire, Kelsey Peters, Brooklyn Porter, Ally Tarpley, Gary Whitworth, Antione Winters, Cristyn Emberton, Anna Lara, Bella Tarpley, Jayda Young, Xaviar Odom and Brianna Jernigan. Teachers: Donna Davis, Karlee Ashford, Lynsey Nixon, Tracey Todd, Sharon Smith and Shari Morgan. This is a very nice thing. I know the children just loved it. Very nice.